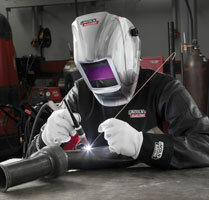 The Red Line Welding Apparel line includes gloves, jackets, caps and safety glasses. Five types of welding gloves, four jacket options, do-rags, beanies, caps and four pairs of indoor safety glasses are available. All eyewear meets ANSI Z87.1+ and CSA Z94.3 standards and offers 99.9 percent UV-A, -B and -C protection.